Do you have children who participate in contact sports? 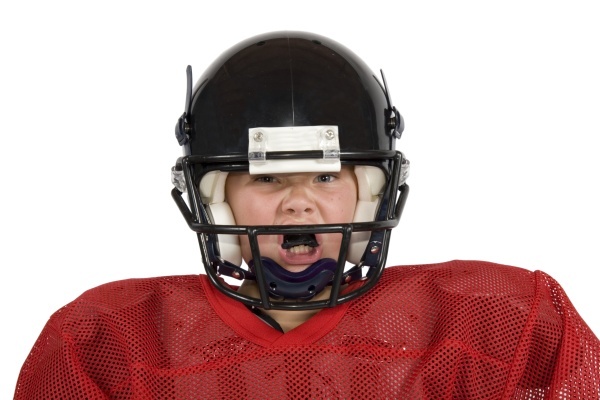 Are their teeth fully protected from unexpected collisions, which are fairly common among sport athletes? In one year alone, about 5 million teeth will be knocked out, and most are from sport collisions. Your children’s teeth can be fully protected with mouthguards, which are customized right in Dr. Michael Bodensteiner’s office. There are many advantages of investing in dental mouthguards. This video beautifully highlights how mouthguards have saved many athletes’ teeth, saving them thousands of dollars from restorative dental treatments. Most people settle for the store bought mouthguards because of its cost. However, it does not get the job done of providing teeth of the utmost protection. With store bought mouthguards, it is not customized to your bite. The athlete will have to fully bite into the guard to keep it in place, making them concentrate on their beloved sport AND keeping their mouthguard in place. However, with Dr. Bodensteiner’s mouthguards, it is customized to each patient’s bite. It’ll snugly protect their teeth while they fully concentrate on the sport. Mouthguards can protect your teeth from actions out of your control, and as a respected dentist in Visalia, Dr. Bodensteiner can customize mouthguards precisely to you and your family’s bite. Give us a call today to for a mouthguard consultation, and protect your teeth from traumatic, severe damage. Share this information with your friends and family who are active in sports, and warn them how costly restoring damaged teeth can be.